I’ve just put a new zip in a pair of jeans, an incredibly time consuming job. The trouble is, unless you are prepared to unpick virtually every seam, you have to work on the fly while the jeans are in their three dimensional form, not on the flat front part of the garment as you would if you were making it from scratch. After spending most of Good Friday on it, it’s done, and I’ve learned two new skills in the process: how to shorten a metal-toothed zip and, in what is quite possibly a world first, how to tone down overly bright sewing thread using Indian ink. I was driven by the desire not to have to buy any more haberdashery as I already have enough zips and thread to last me the rest of my life. First, the zip. I found that I already had a blue zip with silver-coloured teeth (the rivets and existing zip on these jeans were silver rather than the more usual copper and brass), but it was an inch too long. OK, it’s not as dark a blue as I’d like, but you don’t see the zip when the jeans are on and, in any case, they will get paler as they wear. I’ve often shortened a nylon zip by applying a blob of superglue (or epoxy glue on heavy duty zips) to the teeth to make a new bottom stopper and then cutting off the excess below it. 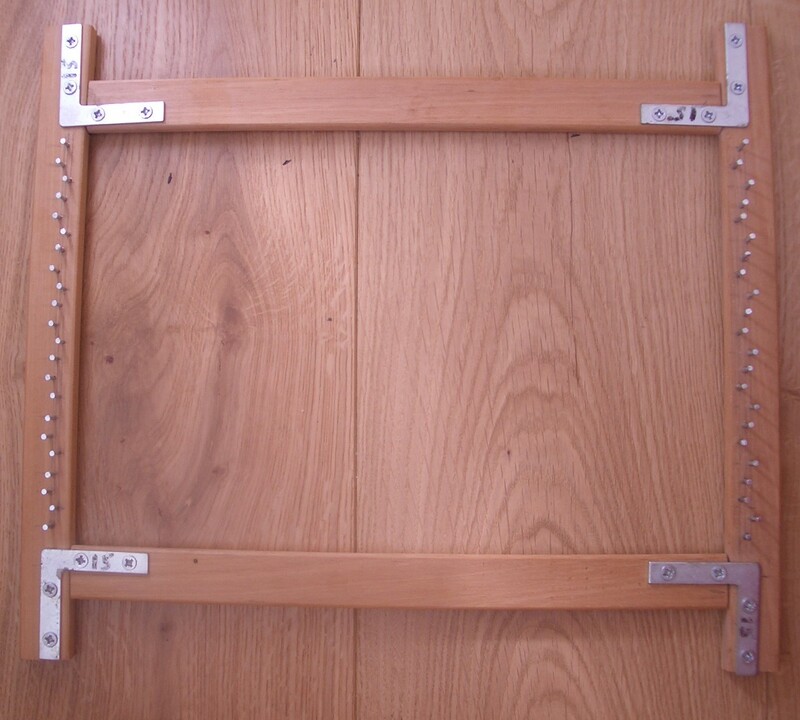 But how to shorten a metal zip? I turned to YouTube and discovered that they are best shortened from the top instead of the bottom. I used the method in a video called How to remove metal zipper teeth which involves cutting off the unwanted teeth with sidecutter pliers. I also used the sidecutters to detach the top stops carefully, without damaging them, and then squeezed them back on in their new position. 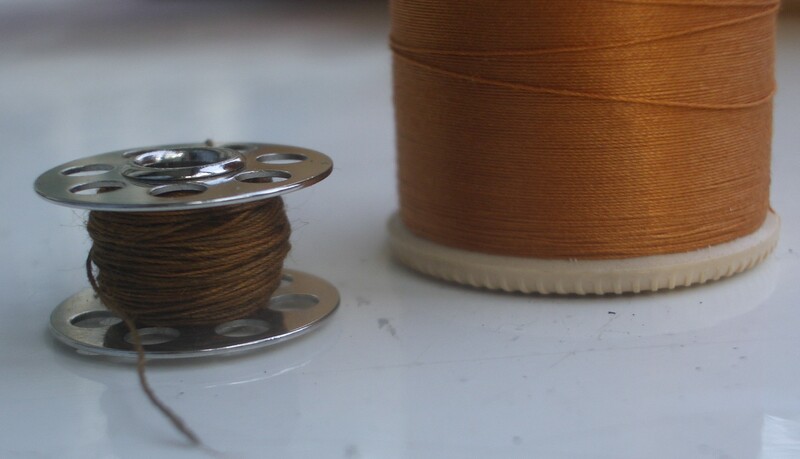 With the zip now the right length, I sorted through my stock of cotton sewing threads and found a light orangey brown that looked about right. 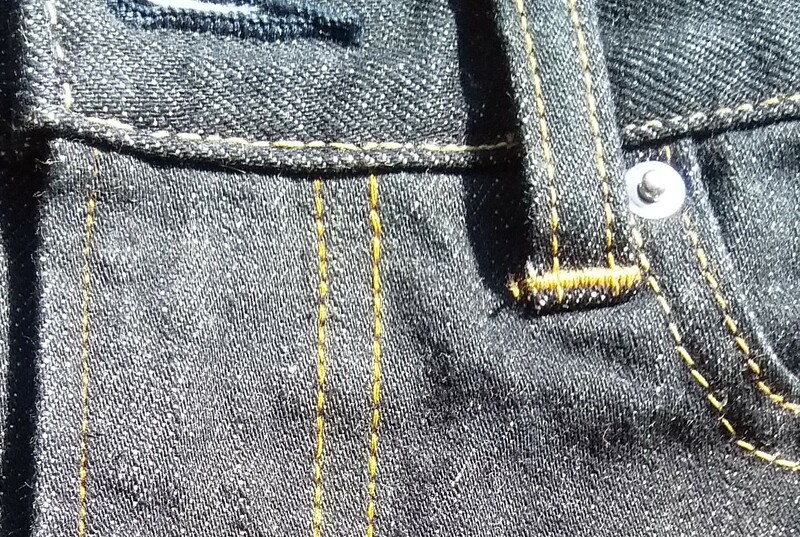 But when I held it alongside the topstitching on the jeans it was far too bright. I had a red onion skin dyebath I’d prepared to re-dye cushion cover backs (more on that below), so I poured some of it into a cup and threw in a length of thread before microwaving it several times to hold it near boiling point for 30 minutes or so. When I removed the thread, rinsed it and dried it, it looked exactly the same colour as the rest of the thread on the reel. Which shouldn’t have been a surprise, because my previous onion skin dyeing experiments had shown that the red coloured dyebath gives a cream colour on cotton, and clearly that wasn’t a strong enough change to show up on orange/brown. Time for a rethink. I needed to darken the shade of the thread to make it more brown and less orange, and ink seemed to be a possibility. 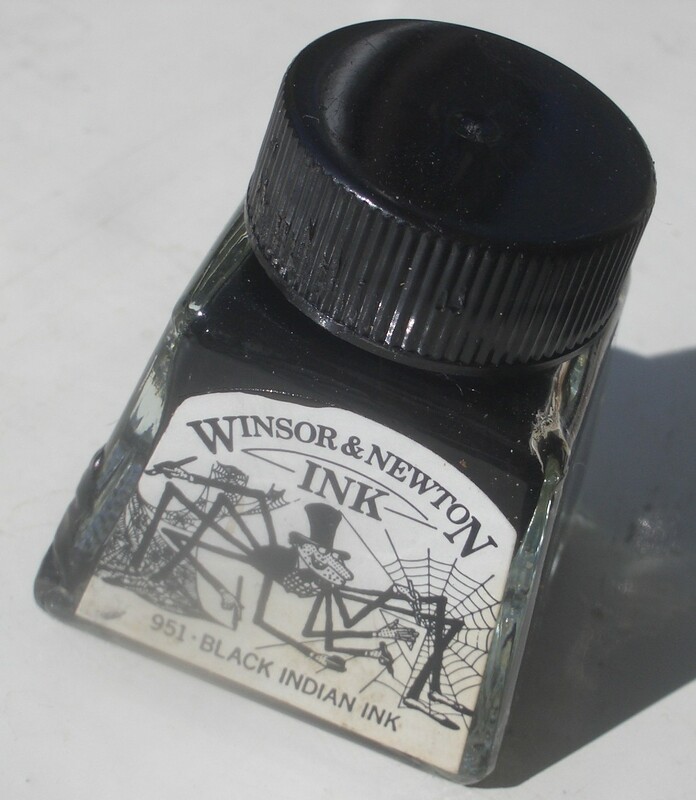 I didn’t have any brown ink, but I did find an old bottle of Indian ink. This ink is famously bleed-resistant and waterproof once dry, but it can be diluted with water while it is still in liquid form. If it will permanently colour paper – which is made from plant fibre – then there must be a good chance it will colour cotton thread, yes? Nowhere on the internet could I find any reference to using Indian ink on cotton textiles. I diluted a little of the ink and tried it out on a short length of thread, and the result wasn’t bad – brown ink would have been better, but the overdyeing with black certainly toned down the colour. And once it was dry it proved to be colourfast to washing. I wound a few metres of thread around the tines of a fork and dipped it repeatedly into dilute Indian ink, unwrapping it and allowing it to dry fully each time, until I got the colour I wanted. It took three goes before I ended up with a suitably dull orange. 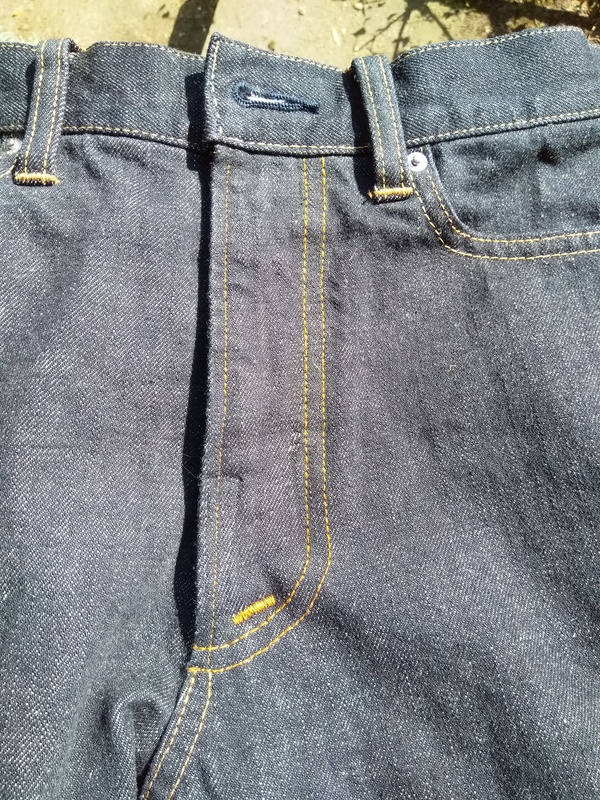 The only issue now was the thickness of the thread, because it was a Sylko 50 and I estimate the jeans are topstitched with 30. In all the time I’ve had my sewing machine (decades) I’ve never used the second spindle which is meant for twin needle stitching. I put another two reels of Sylko 50 on the two spindles – I didn’t have enough of the orange for non-essential use – and fed them together through the upper thread path and the eye of the needle. Then, with a single thread in the bobbin as normal, I tried topstitching and found that it not only worked but looked very similar in thickness to the topstitching I was trying to match. I put the two ends of the overdyed thread together and then hand wound it all, doubled, onto a spare bobbin. 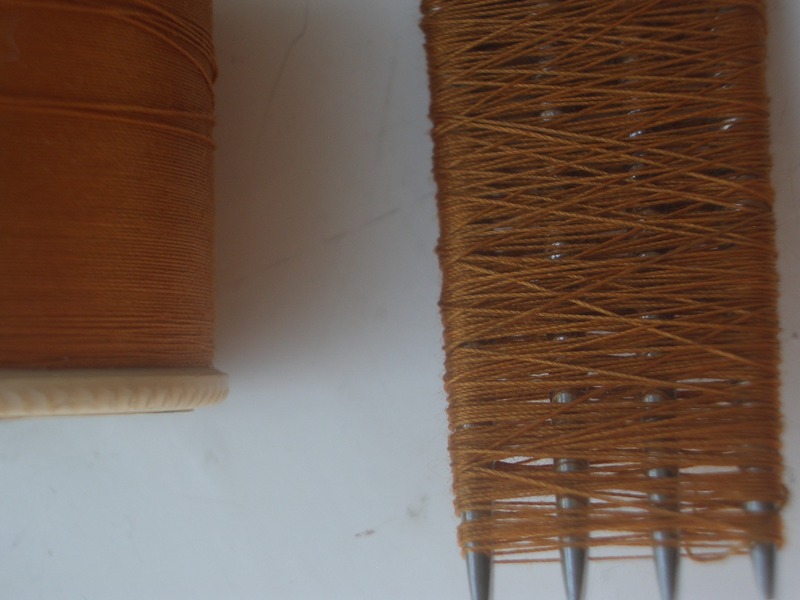 I used this as the upper thread with plain, undyed thread on another bobbin for the lower thread. The end result, I think, looks pretty good. 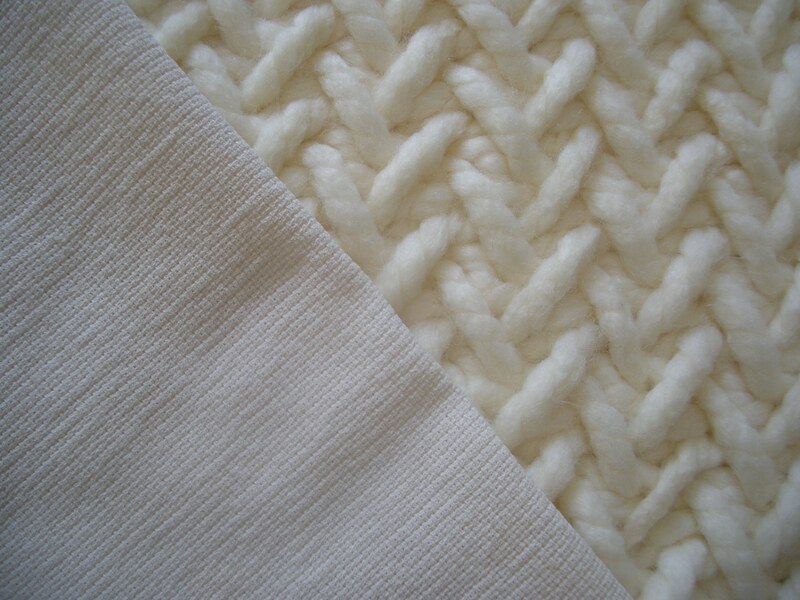 Back in January I made two cushion fronts using super-chunky yarn and 20mm knitting needles. 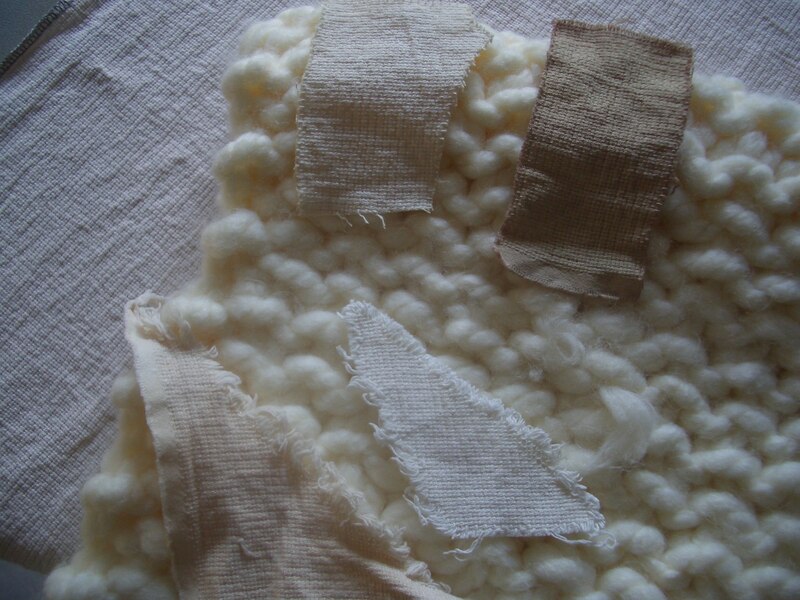 I tried to dye some plain white cotton fabric a toning colour for the backs, using onion skins. A small sample dyed in a glass bowl in the microwave with red onion skins turned out well, but the bowl wasn’t big enough for the full-sized fabric and the colour changed when I did the dyeing on the hob in an aluminium-based saucepan. The off-colour fabric has lain untouched for two months while I pondered what to do. Last week, in a kill-or-cure frame of mind, I bleached the length of fabric and was relieved to find that all the colour was removed and I was back to white. (Note to self: onion skin dye is fast to washing, but not sodium hypochlorite.) I hunted around for a larger bowl and found a horrible old plastic thing that we keep under the bath for plumbing emergencies. It’s not as big as it ought to be for dyeing this much cloth, but it is pretty much the maximum size that will fit in the microwave. I dyed the fabric in this bowl, using the skin of one and a half red onions and stirring it well after every zap of power to try and make up for the inadequate volume of the dyebath. The colour is better than before, a cream that lacks the grey hue which must have come from the aluminium pan. It’s not a perfect match for the yarn, and the colour is not completely even despite all my stirring, but it will do. As the dyed fabric has quite an open weave, and the knitted fronts are not as stable as a woven fabric, I’m going to back both with some curtain lining. I have two offcuts that are quite different colours and neither is big enough for two fronts and two backs. I will have to use one type of lining for both fronts and the other for both backs. I need a little thinking time first, to decide how best to assemble these four pieces of fabric per cushion cover. I’ve worn this cardigan a few times since I finished it (or thought I had), but I wasn’t happy with the bracelet-length sleeves. I’ve been putting off doing anything about it, while knowing that I’d have to sooner or later or the annoying gap at my wrists would drive me mad. I had 20g of yarn left over, so no excuse. At the weekend I sat down and laboriously unpicked the cuffs that I’d cast off using the tubular method, equally laboriously, only a fortnight earlier. Not an easy task with Shetland yarn that semi-felts itself together when it’s washed. Then I wound the yarn into two equally sized balls, doubling it while I was at it (I knitted my Flaum with two ends of 4-ply), joined each one to the unpicked yarn with felted grafts and set to work. 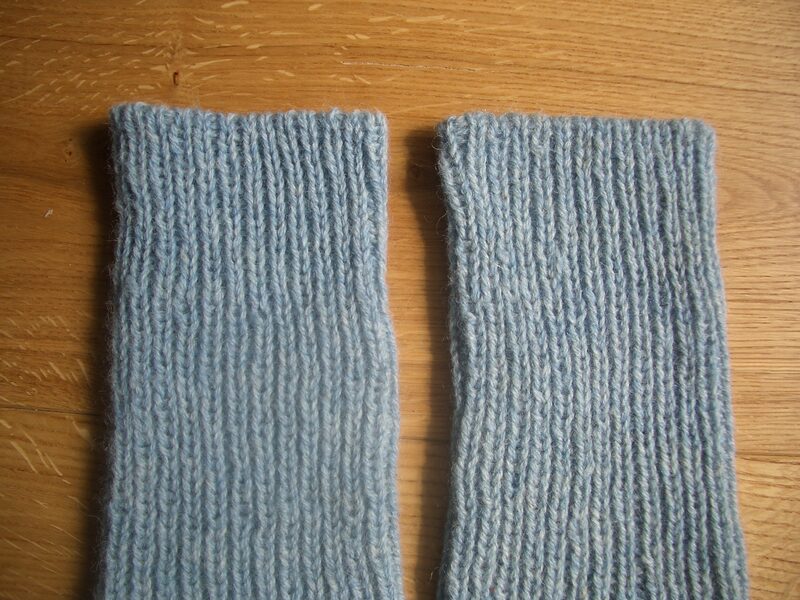 Actually, it didn’t take long to do 17 extra rounds of ribbing per sleeve and then the tubular cast-off again. I didn’t even need to look up how to do it this time, it really is easily memorised if you know how to graft stocking stitch together. 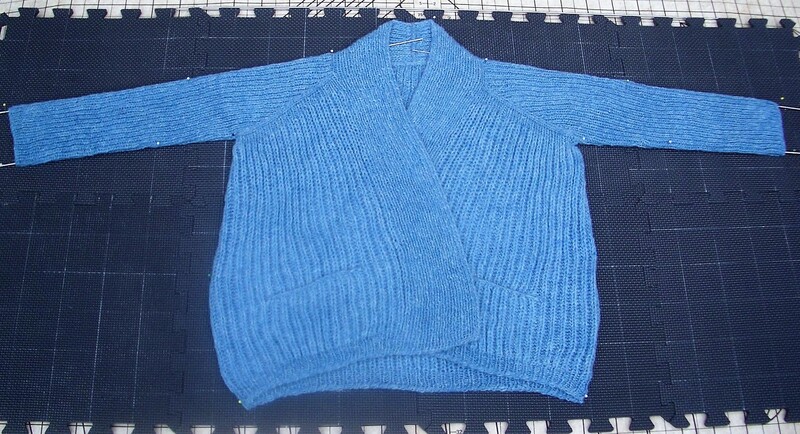 The extended portions looked decidedly grubby compared to the rest of the cardi which had been washed to remove the lanolin and 35 years’ worth of dirt and mould. This last 20g of yarn was on the outside of the cone originally, which meant it was dirtier than the rest. But I’m glad to say that the cuffs have come up all blue and fluffy like the rest of the garment after I washed them and blocked them using the calf portion of my home-made sock blockers. Much better. I’m so pleased I did this. And all that’s left of the blue Shetland 4-ply is a metre or two which I’ll keep for darning, should it ever be needed. It’s a good job I did the pocket linings in a contrast colour though, or there wouldn’t have been enough for full length sleeves. I need another project now. I’d like to try crocheting a summer handbag. Might need to experiment with string before deciding what yarn would be best. I’ve been trying out tapestry weaving. Inspired by the wonderful, large tapestries we saw at the Hoxa Tapestry Gallery, Orkney some years ago, my dear husband made me a small weaving frame when we got home. It has lain unused ever since. I would love to be able to create something like Bridget Riley’s Arrest 3 waves. I’ve started with a simpler design though, while I get the hang of the tapestry weaving technique. I’m trying to suggest rolling hills. The process is quite relaxing, meditative even. 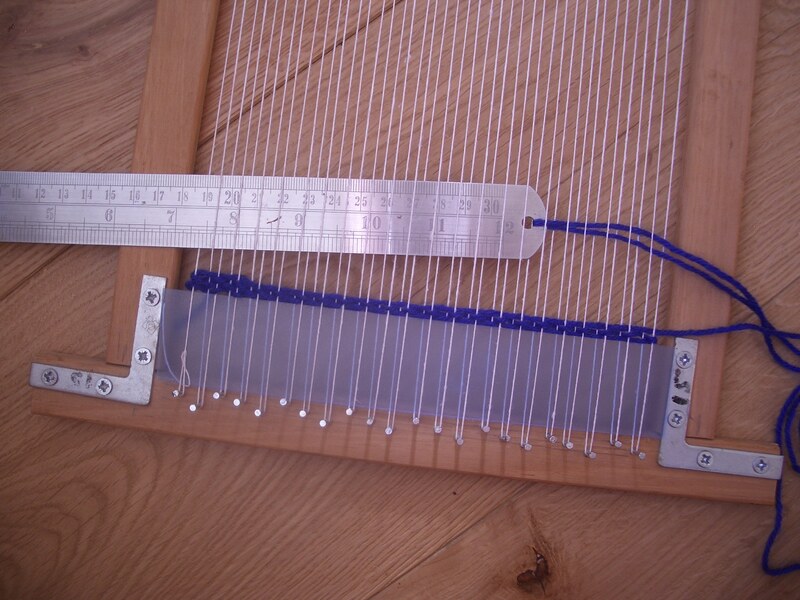 I’ve warped this mini loom with linen yarn and I’m using a steel ruler as a shuttle to weave with wool tapisserie yarns that are meant for embroidery. Like so many of the craft materials I use today, I’ve had both the warp and weft yarns for decades. 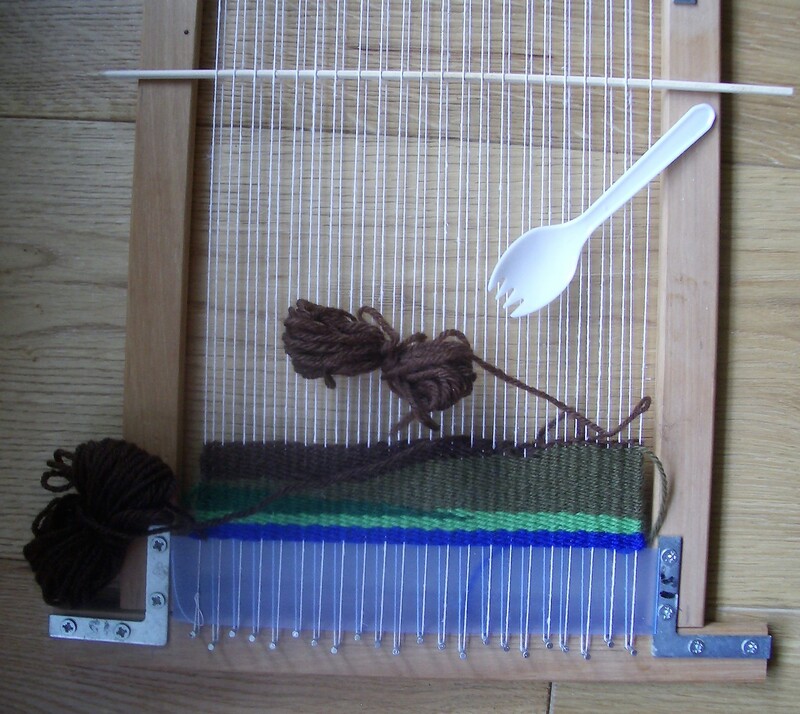 As far as I can remember, I bought the linen to warp an inkle loom I made. That has never been used in anger either, maybe I’ll get around to it one day soon if the weaving bug bites. The bamboo skewer is keeping one of the sheds open, and I found a plastic “spork” in the back of a drawer which I’m using to beat down the wefts. At the moment I’m just making up the design as I go rather than working from a cartoon held behind the warps. That’s probably a mistake and I may well pull out what I’ve done. The effort won’t be wasted though, I’m slowly getting a more even tension and learning how to change colours without leaving obvious holes. My Flaum cardigan has, as I hoped, become much softer and fluffier after drying on the blocking mat. I’ve worn it a few times, and convinced myself that the sleeves need to be lengthened. Fortunately, I have 20g of yarn left and that should be enough. I blocked the sleeves quite hard to widen them because I didn’t want them too clingy and skinny-ribbed. The predictable result is that they have shortened a bit and are now bracelet length rather than the wrist length I prefer. 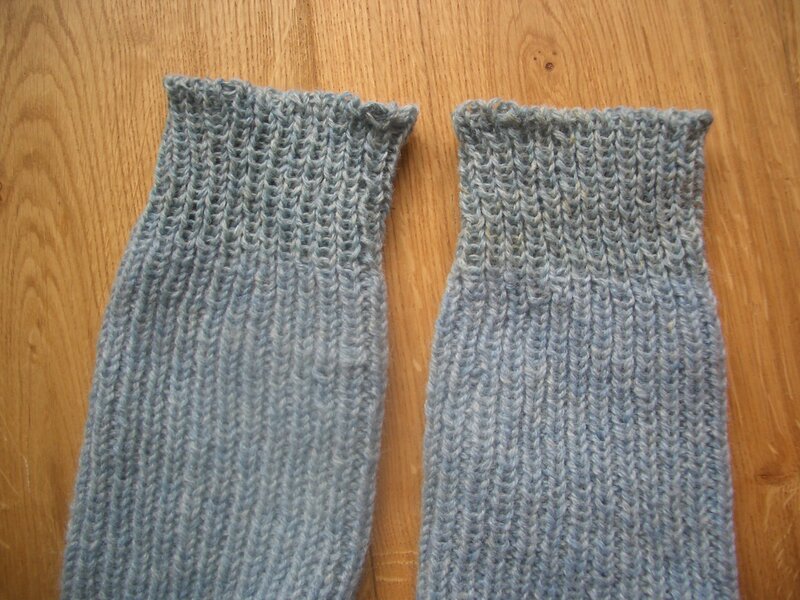 I shall have to unpick the laboriously worked tubular cast-offs and then wash and block just the new cuffs. I’m putting off the task, but I know I must knuckle down and do it or I never will. 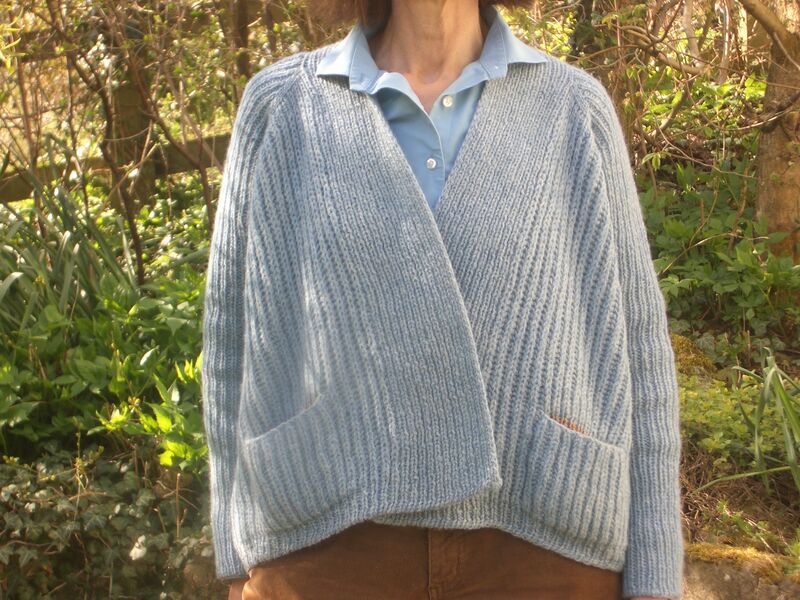 I finished the tubular cast-off around the hem and cuffs of this cardigan (Flaum) yesterday. I’ve never done a tubular cast-off before, and the instructions in the pattern seemed complicated. Not only that, they didn’t make sense because the two set-up rounds were supposedly the same for the worked-flat hem as for the in-the-round sleeves, and clearly that wasn’t going to work. So I looked online, as you do, and found not only that I was right about the set-up, but there’s a much easier way to work the sewn part of the cast-off. As is so often the case, Ysolda Teague explains it clearly. 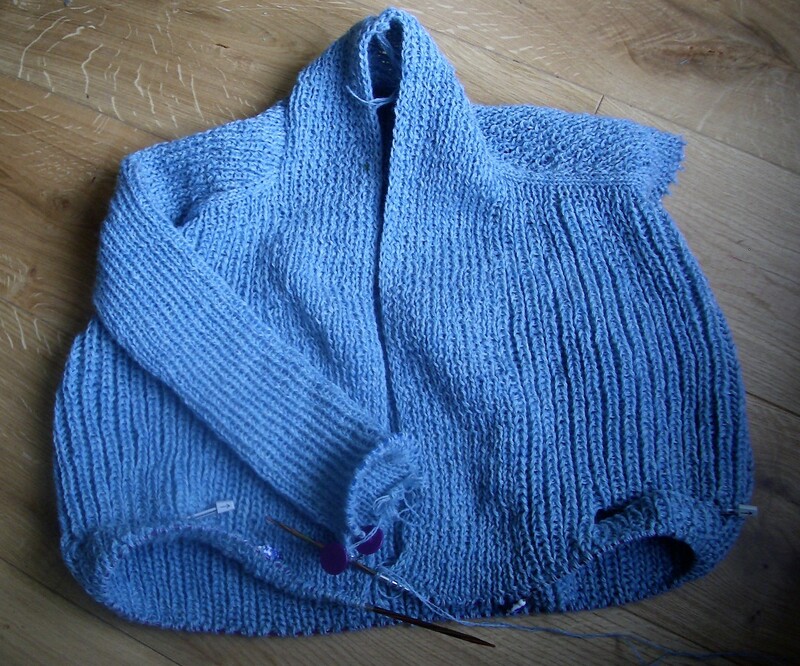 The only issue with working a Kitchener graft with over a hundred stitches on each knitting needle is that you need a very long length of yarn threaded through your darning needle, and it takes a lot of time to start with to pull the yarn through each pair of stitches and stop it tangling. But at least it gets quicker and easier as the yarn tail reduces. Since discovering the tubular cast-on I’ve used it a lot because it looks great and produces an edge that stretches as much as the ribbing. After this, my first experience with its matching cast-off, I can see that I’ll be using it just as much when knitting anything that ends with ribbing. The finished edges look impressively neat. In the end I didn’t need to use contrast yarn for the tips of the cuffs and hem. I ended up with 20g of my 508g cone of blue Shetland yarn left, and I used 12g of contrast colour for the pocket linings. Today my Flaum has been blocking in the sunshine – the first al fresco blocking of 2019 – and it’ll be interesting to see when it’s dry how much its starting weight of 500g has dropped. It took two gentle hand washes to get rid of the lanolin, and I know from knitting this and similar spun-in-the-grease Shetlands in the past that it will be much fluffier and loftier after its wash. The colour has certainly brightened. 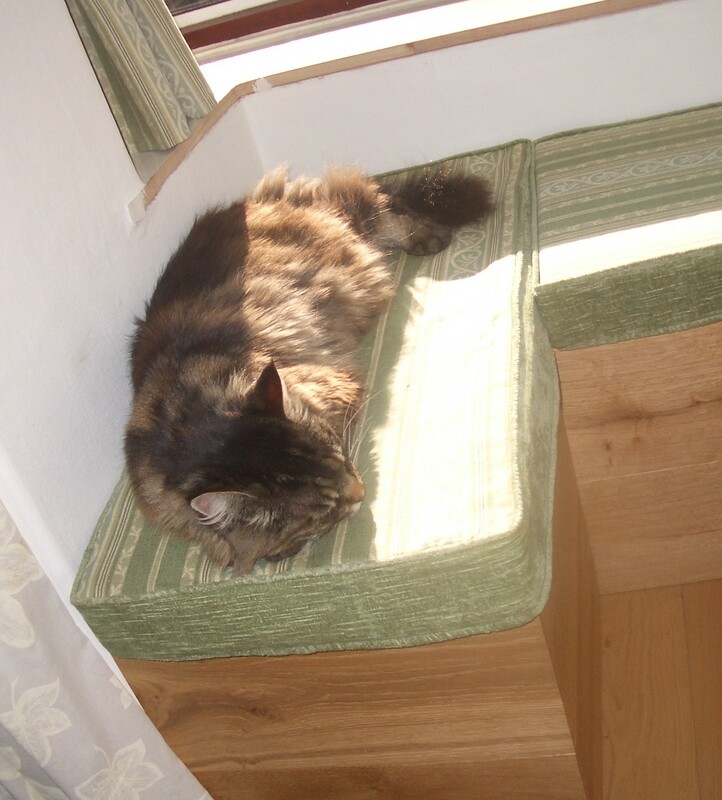 While one member of the family has been enjoying the new window seat cushions, I’ve been doing some woodwork. 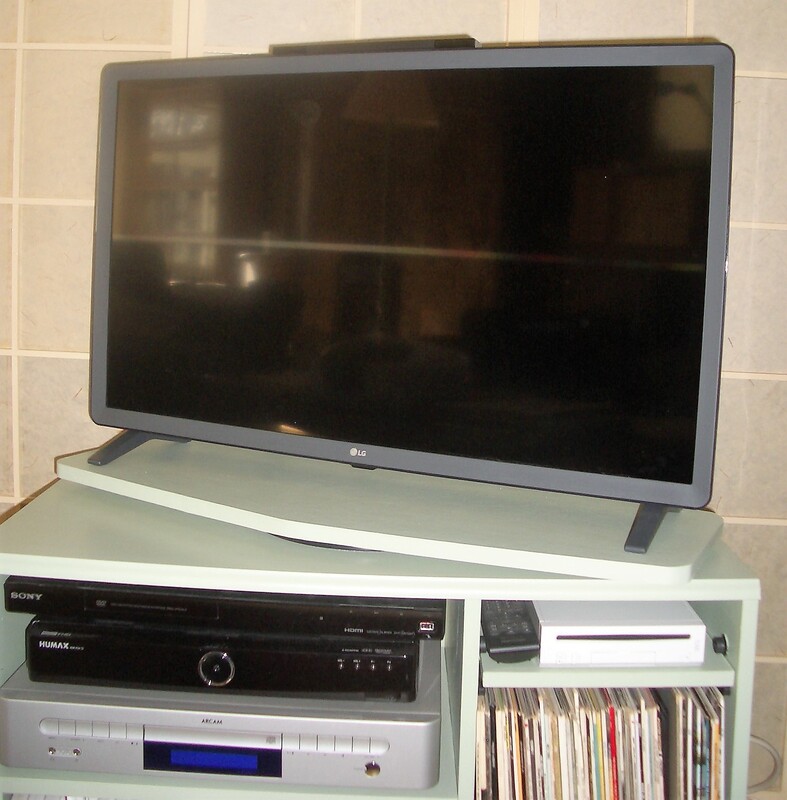 Our 11-year-old television went phut recently, and wasn’t worth fixing. I’m pretty sure that the problem was a failure of the LED backlight, and replacing it wouldn’t have been worthwhile because it’s an expensive repair and something else is sure to go wrong soon with a TV of that age. We’ve bought a new one with the same screen size as its predecessor. As is often the way with electronic goods, it cost half as much, weighs half as much and has way more features. Once I’d got the hang of the new television’s many “smart” capabilities, the only thing I found annoying was its stand. Whereas the old model had a central pedestal, the new one basically has a foot at each corner. Which is fine, until we want to turn it to face a different part of the room, because it can only be turned a short way in either direction without the feet at diagonally opposite corners falling off the edge of the hi-fi unit it sits on. I put up with this for a week or two before deciding something had to be done. I found a cheap plastic turntable on Amazon that’s meant for putting under large pot plants. And in the garage was an offcut of melamine-faced chipboard (MFC) that was a little damp, but didn’t look too bad once I’d brought it indoors and dried it out. 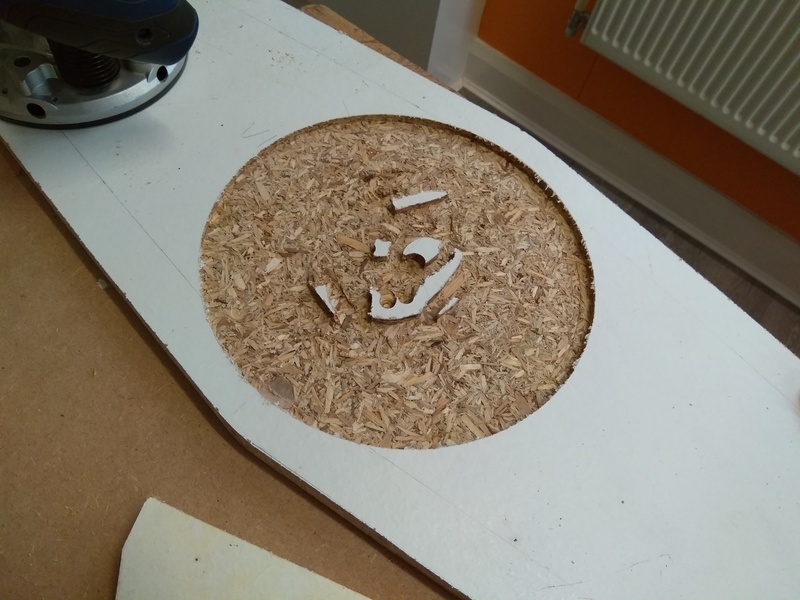 I used a jigsaw to cut a lozenge-shaped piece of MFC that was wide enough in the centre to accommodate the turntable and tapered down to ends just wider than the spacing of the TV’s feet, with rounded corners to avoid taking a lump out of the wall if I turn it too far. Then I used a router to cut out a recess on the underside for the turntable. 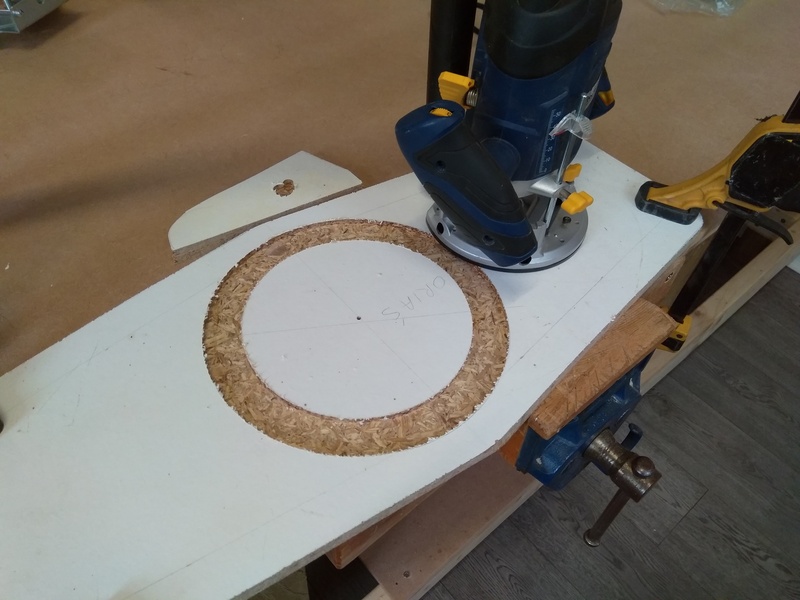 I find routers a bit scary, but I just took it slowly, working in ever-diminishing rings until I reached the minimum radius of the circle-cutting jig. Then I went freehand with the router to remove more material. I cut down to about half the thickness of the plastic turntable. When I’d cut away as much material as I dared – any more and it would have been impossible to keep the router level – I removed the remainder with a chisel. Amazingly, the turntable fitted perfectly into the recess without the need for any adjustment (or glue!). I finished my rotating platform by applying iron-on edging tape all around the outer edges then painting it to match the hi-fi unit I revamped some time ago. I’m delighted with this rotating shelf. It appears to float an inch or so above the top of the unit, which means the turntable is only visible from a low angle, like in the photo above. Now I can turn the TV with a fingertip to face wherever we’re sitting. My fisherman’s rib cardi, Flaum, is progressing. 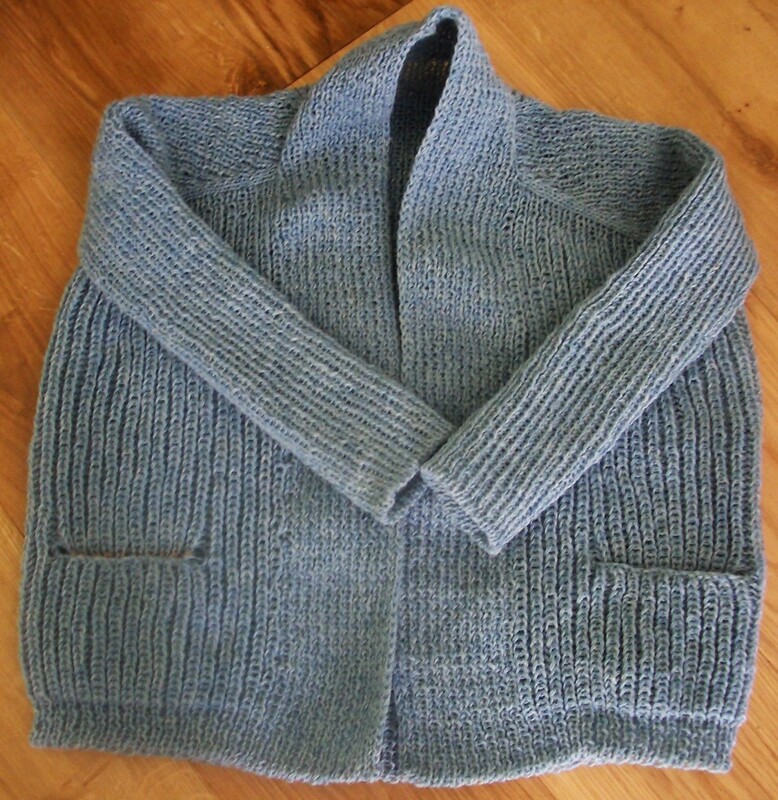 I’ve got to the point where I know that my 500-odd grammes of blue Shetland wool won’t be enough and I’ll need to use a contrast yarn for the pocket linings, cuffs and hem. 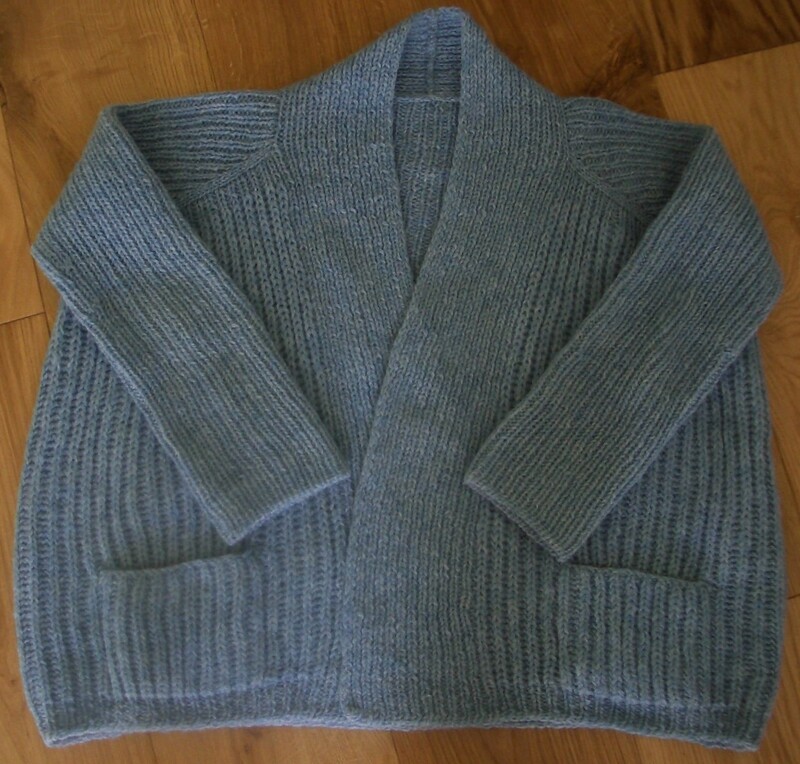 Even so I will have to live with a cardigan that is rather more cropped than I would have liked – it was either that or go with the ¾ length sleeves the pattern calls for, and I’ve never seen the point of a thick jumper that leaves the wearer with chilly wrists. I hope that the two-tone effect looks more like a conscious design choice than the needs-must solution that it really is. 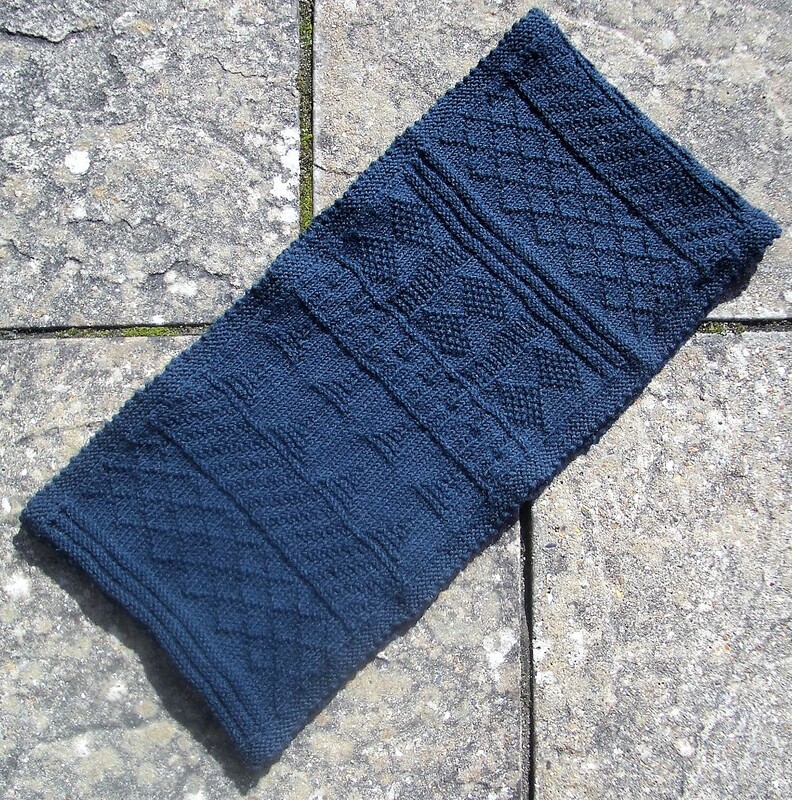 I’ve just published my second knitting pattern on Ravelry, which is very exciting. 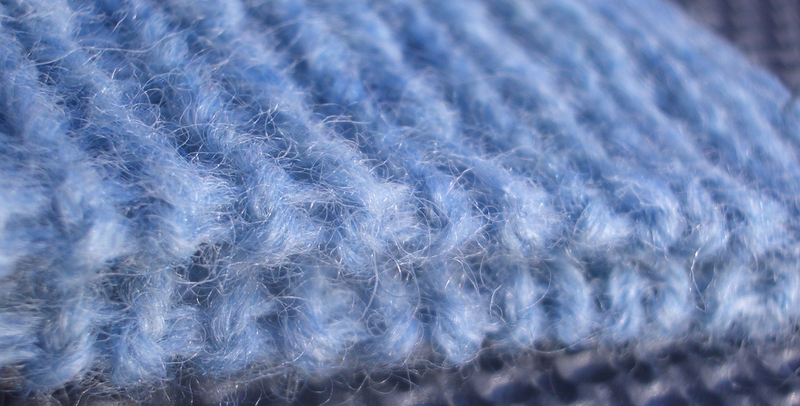 I dipped a toe in the designing water in 2016 by listing a free hat pattern, Blue Selbu, but the latest one has involved a lot more work and consequently I’m charging a modest price for it. It’s a seamless, gansey-style cowl that I have called Everything But The Gussets, or EBTG for short. EBTG started out, as so many of the things I make, as a present for a friend who lives in Cornwall. She took me to Polperro Museum in late summer 2017 and was quite taken with the knitted items we found there. I offered to make her a gansey/knitfrock – she’s a good friend and I enjoyed knitting my own gansey very much – but she’s not a big wearer of heavy sweaters and asked instead if I’d make her a long cowl. It so happened that I’d been wondering what on earth to do with half a cone of yarn left over from my gansey, so I rashly promised that she’d have a cowl by Christmas. 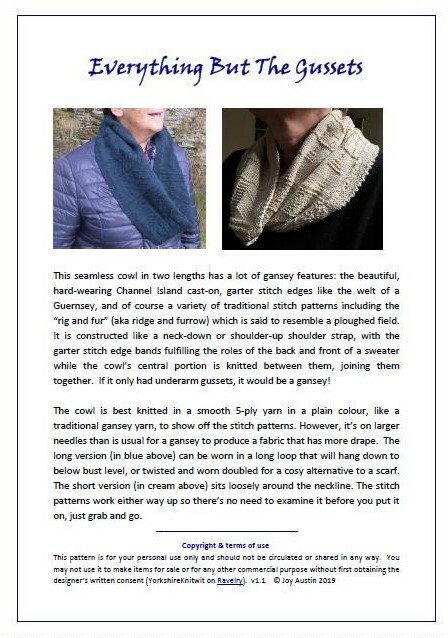 When I got home from Cornwall I started thinking about how to make this cowl, a process I ruminated on for some time as my posts from the time show (especially Designing a Gansey Cowl, Part 1 and Part 2). I looked at various designs and none of them seemed quite to fit the bill. In particular, I wanted the stitch patterns not to have an obvious “right way up” but to look OK hanging downwards, which meant the cowl would need to be knitted longitudinally and the end grafted to the start to create the loop. But I also wanted to incorporate the Channel Island cast-on, which meant each edge would need to be worked from the cast-on edge inwards, towards the middle. As I thought about this, it suddenly became obvious that what I was trying to create was a giant, circular shoulder strap. That seemed appropriate for a gansey-influenced design, and I set to work knitting a mini cowl in acrylic yarn, starting with two narrow bands knitted in the round and then linking them together by working the central portion of the cowl between them, back and forth, taking in live stitches from the bands at the end of every row. The concept worked and I was then able to design the cowl for real. Needless to say it didn’t get finished for Christmas that year, but it was well received when it did eventually arrive in Cornwall. That was just over a year ago, and I did nothing more until last autumn. With the cowl-wearing season fast approaching, I thought I might as well write up the instructions in case anyone else wanted to create a similar item. It just seemed a shame to consign all my notes to the bin, and I was curious as to whether anyone else would want to knit a cowl with such an unusual construction. Finding a few kind souls who’d be prepared to try and knit from the draft instructions was going to be essential. Of course, I should have started the pattern-writing process a lot earlier, because by the time I had it all charted and down on paper it was almost Christmas again and no one had the time to do any test knitting. But come the New Year, four fearless testers started work and, I’m happy to say, all managed to complete a cowl without any significant problems. Nevertheless, the testers’ comments have enabled me to improve the clarity of the pattern substantially, and I’m confident now that any moderately experienced knitter will be able to make a successful cowl. Knowing that some people prefer a shorter one, the final version of the pattern has the option to knit a cowl that’s only 2/3 as long as the original. And the tester who made the short cowl was kind enough to allow me to use a photo of her lovely example in the pattern. You can find info on both of my published patterns on the Knitting Patterns page.